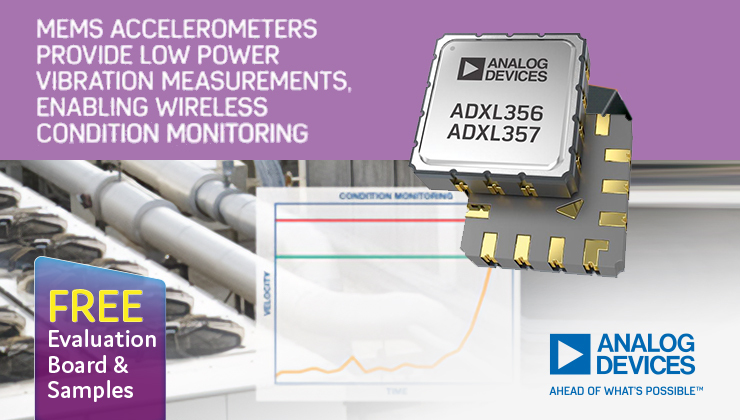 Analog Devices' MEMS Accelerometers Provide Low Power Vibration Measurements, Enabling Wireless Condition Monitoring, Samples available from Anglia. Analog Devices have added two new devices to its popular series of low noise, low drift, low power, three-axis MEMS accelerometers. The low noise performance over high frequencies provided by the new ADXL356 and ADXL357 MEMS accelerometers delivers high resolution vibration measurements that enable the early detection of machine failure in condition monitoring applications. This performance comes with very low power consumption, making the ADXL356 and ADXL357 ideal for wireless sensor networks. These new MEMS accelerometers are also designed to provide accurate and reliable tilt measurements for environments high in shock and vibration without saturating the sensor, an important requirement for tilt measurement applications on heavy equipment or airborne platforms such as unmanned aerial vehicles (UAVs). 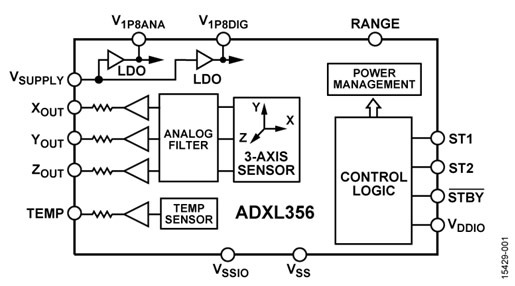 The ADXL356 and ADXL357 MEMS accelerometers are the latest examples of high performance sensor technology from Analog Devices that provides high-quality data for Internet of Things (IoT) applications and enables intelligent sensing from the edge of the network. The analog output ADXL356 and the digital output ADXL357 three-axis accelerometers provide selectable measurement ranges of ±10 g, ±20 g and ±40 g for greater flexibility. The ADXL356 and ADXL357 also offer industry leading noise density of 80 µg/root Hz, with guaranteed maximum 0g offset drift over temperature of 0.75 mg/C, enabling precision applications with minimal calibration. In addition, the hermetic package helps ensure that the end product conforms to its repeatability and stability specifications long after it leaves the factory. Highly integrated in a compact form factor, the low power ADXL357 requires only 200 µA, extending the life of battery powered applications including wireless networks for condition monitoring, airborne platforms such as UAVs or IoT applications. The devices are supported by the EVAL-ADXL35x-Z simple evaluation boards which allow quick evaluation of the performance of the low power, low noise, low drift 3-axis, MEMS accelerometers. These evaluation boards are ideal for evaluation of the ADXL35x accelerometer series in an existing systems because the stiffness and the small size of the evaluation board minimize the effect of the board on both the system and acceleration measurements. Click here to download the datasheet for ADXL356/7. Click here to download the user guide for EVAL-ADXL356/7. Anglia are offering customers FREE samples and evaluation boards for the ADXL356 and ADXL357 series of three-axis MEMS accelerometers from Analog Devices, please fill in the form below to register for your FREE samples now.